A brand-new launch platform built for NASA moon rockets may instead help send people to asteroids or Mars — or a private company could use it to loft astronauts to low-Earth orbit. NASA completed the $500 million mobile launch platform in 2010 to prepare for the Ares 1 rocket, part of its moon-oriented Constellation program. Though the Obama administration canceled Constellation last year, the platform should still get significant use, NASA officials said. The U.S. space agency is looking at adapting the structure for its next-generation deep space rocket, which is known as the Space Launch System (SLS). While that may be the platform's most likely fate, the private company Alliant Techsystems (ATK) has also inquired about the structure for its Liberty rocket, a contender to ferry NASA astronauts to the International Space Station. At NASA's Kennedy Space Center in Florida, NASA's new mobile launcher, or ML, support structure, consisting of a base, a tower and a launch mount, is complete in this August 2010 image. It took about two years to construct the launcher in the Mobile Launcher Park site, north of the Vehicle Assembly Building, or VAB. The mobile launch platform stands about 390 feet (119 meters) tall and is parked at NASA's seaside Kennedy Space Center in Cape Canaveral, Fla. Engineers craned the final piece of the massive platform into place in January 2010. But a month later, President Barack Obama announced he was canceling Constellation and directing NASA to work instead toward getting astronauts to an asteroid by 2025, then on to Mars by the mid-2030s. When the giant rocket is ready to go, it could well blast off from the mobile launch platform. 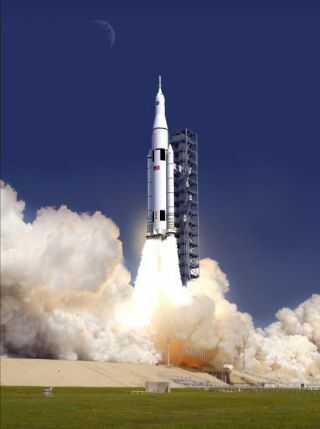 "The basic structure of the tower is in place and could support an SLS rocket," Beutel told SPACE.com in an email. "So, we're looking at the modifications that would be needed to specifically support the SLS and Orion spacecraft, such as the power and propellant umbilicals (pipes, cables, etc.) now that we've announced the SLS architecture." While that's what NASA's looking at right now, nothing is set in stone yet, Beutel added. And other parties have expressed interest in using the platform as well. The Utah-based ATK is working with European firm Astrium to develop a rocket called Liberty. For 30 years, ATK provided the reusable twin solid rocket boosters that launched NASA's space shuttles to low-Earth orbit. ATK also was tapped to develop the first stage of the Ares 1, and it built a solid rocket motor similar to the shuttle's boosters, but slightly longer. Liberty will incorporate that engine as a first stage and Astrium's Ariane 5 rocket as a second stage, ATK officials have said. ATK and Astrium hope that NASA selects Liberty to launch its crews to low-Earth orbit. Under its Commercial Crew Development (CCDev) program, the space agency is seeking to spur the capabilities of American private spaceflight companies. NASA hopes these firms can eventually take over the taxi role of ferrying its astronauts to and from the International Space Station — a service that Russian Soyuz vehicles have been exclusively providing in the wake of the space shuttle fleet's retirement this past July. The agency hopes private spacecraft will be ready to go by 2015 or so. Liberty is slated to stand about 300 feet tall (91 m) — considerably smaller than the SLS, which may be a towering 400 feet (122 m) in its final configuration. But the mobile launch platform could accommodate either rocket at the moment, Beutel said, since the wiring and piping that would make it specific to one launch vehicle haven't been installed yet. "ATK has expressed interest in using it, and we've discussed it with them," Beutel said. While NASA has yet to make a final decision about the mobile launcher's fate, the death of Constellation did not consign the massive structure to the scrap heap. "I can definitely say the mobile launcher has a lot of potential uses beyond Ares 1," Beutel said.